Soils rich in fine clay particles are called ‘heavy soils’ and, although hard to manage, are also potentially very fertile when treated in the right way. Warning: if worked or walked on when wet they lose their structure, and become puddled and compacted. Remedying this is slow and laborious; so damage should be avoided at all costs. Clay particles are amazingly dominant in a soil. This is explained by the relative size of the different particles (clay, sand and silt) that soil contains. Clay particles are very small but, because this allows more particles to fit in any given space (say 1cm cubed), they have huge surface area that dominates the physical properties of soil. In comparison, sand and silt particles are larger, so fewer particles are needed to fill a space (say 1cm cubed again). As a result, the overall surface area of sand and silt is smaller and so much less influential on determining the characteristics of a soil than the clay particles. In practice what this means is: to dilute the proportion of clay in a heavy soil requires very large volumes of grit or other material. 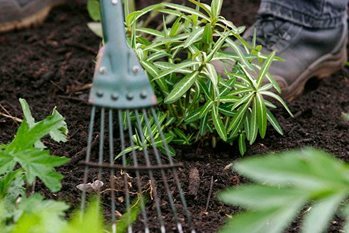 It is seldom feasible to do this on anything but a small scale and, for most gardeners, other options such as raised beds, adding organic matter and choosing plants that thrive in clays are more practical. Even where a clay soil contains for example 40 percent clay particles (a relatively modest content compared to heavy clay soils), the proportion of clay in the top cultivated part of the soil would have to be reduced by half to make the soil easy to work. This would require 250kg per sq m (460lbs per sq yd) of grit or gravel. Adding materials to clay can also make the clay less stable, so the soil becomes harder to manage. Experimenting on a small scale at first is recommended to be sure that any additions are worthwhile and won't have damaging effects on workability of the soil. Roses grow particularly well on clay soils. For other plants ideas see our page on plants for clay soils.